CHA Commissioner Sandra Young*, formerly the lead tenant representative from Wells Homes, was credited for being the driving force behind the monument. Michelle Duster, great-granddaughter of Wells, praised Young for her efforts and said the two women were now “permanently connected.” Upon completion, the monument will be donated to the City of Chicago’s Public Art Collection and through the monumental sculpture, “Chicago will join the very few U.S. cities that honors an African American woman,” according to information from the Wells Art Committee. Soft Sheen Founders Betty and Ed Gardner at the dedication of the street named in their honor. Photo by Mary Piemonte. In the searing heat on the afternoon of July 12, a wide spectrum of dignitaries from the City of Chicago, the beauty industry, the business sector, the political arena and grassroots groups gathered together under a tent at 8830 S. Dobson Street for a dedication ceremony for a street sign honoring Ed and Betty Gardner, co-founders of Soft Sheen hair care products for people of color. That street, located near the site where their business was first based, will soon bear their name, honoring the couple’s “long legacy of excellence” in philanthropy and community service. Ed is a former school teacher and assistant principal who quit his job in 1964 and went to work in the basement of his home “mixing and filling bottle of hair conditioners, pressing oil and shampoo,” ultimately creating the nation’s largest black hair care enterprise. After over 30 years in the business, the Gardners retired and sold the company to French-owned conglomerate L’Oreal. 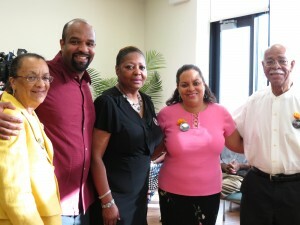 Speakers praised the Gardners for having built their business in the Black community and for hiring people from the community, including numerous minority vendors. 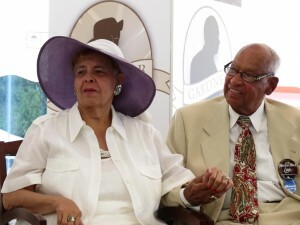 The Gardners, married for 62 years with four children, were also highlighted as the first black shareholders with the Chicago Bulls, and for spearheading the crusade to get Harold Washington elected Chicago’s first Black mayor. The Gardners once owned the old Avalon Theater, 1645 E. 79th St., and changed its name to the New Regal Theater in honor of Chicago’s legendary original Regal Theater, formerly located in the heart of Bronzeville community on 47th Street. Betty ran the New Regal Theater Foundation for many years before the theater was sold in 2009, according to information provided by the Black on Black Love organization, which the Gardners founded in January 1983. Merri Dee, a former television journalist and current state president of the American Association of Retired Persons, told Residents’ Journal after the event that the Gardners also should be recognized for their crime prevention programs. 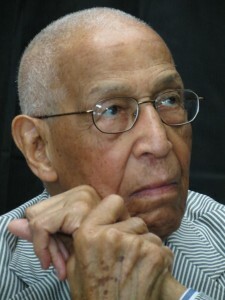 Retired Judge George N. Leighton. Photo by Mary Piemonte. On June 29, the Cook County Criminal Courts Building, 2600 S. California Ave., was re-dedicated to retired Judge George N. Leighton, 99, the first African American to sit on the Illinois Appellate Court. The former judge served as president of the Chicago NAACP for two terms in the 1950s and served more than 20 years as a federal judge. He was appointed to the U.S. District Court for the Northern District of Illinois by President Gerald Ford on Feb. 4, 1976, and retired from the bench in 1987, according to information from Just The Beginning Foundation. According to Robert Whitfield, attorney for the CHA tenants’ Central Advisory Council, Leighton, a Harvard Law School graduate, represented the first Black family who moved into Trumbull Park in the South Deering neighborhood at 105th Street and Yates Avenue. At the event, Whitfield, along with CAC members Myra King and Deverra Beverly, presented an award to Leighton for his part in assisting Donald and Betty Howard in their civil rights case against CHA. The family’s move into the development triggered the race riots there in 1953. Whitfield added that a larger version of the award presented to Leighton will now be on display at the CAC’s office, 243 E. 32nd St.
Cook County Board President Toni Preckwinkle told Residents’ Journal after the event that Ald. Ed Burke (14) suggested honoring Leighton for his “distinguished career.” Other county law enforcement officials agreed to the building dedication. *Editor’s Note: This article includes several references to Sandra Young, who is a board member of We The People Media. This entry was posted	on Wednesday, August 8th, 2012 at 9:40 pm. You can follow any responses to this entry through the RSS 2.0 feed. You can leave a response, or trackback from your own site.